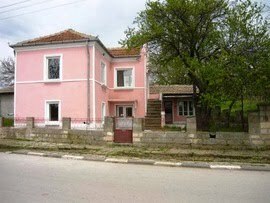 My brother-in-law has a property in Bulgaria and we have been told we can use it whenever but we have never been there yet. I would worry about taking my radio gear with me and not really enjoy being somewhere different if I could not operate radio from a hill top or two. His photographs tell me that it is a very beautiful country. Helen was slightly put off by the mention of bears and wolves in the forest on the route to a local summit which would be ideal to work from. I can see why the house in the picture is so cheap. Barbie pink Uck! Yes, not being the top predator must take the shine out of SOTA operating. But at Bulgarian land prices you could buy your own hill and fence it off to keep things that might want to eat you out. £12,000! I could almost afford that! But I think I love this green and pleasant land too much to leave for good. I do sometimes wonder about retiring to Benidorm one day just to escape the cold. But with only an M6 licence it would be an end to a lovely hobby! I lived abroad once or twice for a few months at a time in my troubled twenties (Spain, Italy, Greece) and I have to say each time I couldn't wait to get back to blighty! North sea oil was like finding a gold cache in your backyard. But now, the party is over. During the party, the population and spending increased exponentially. Now, the money is gone, bad days are coming. Move to Bulgaria or anywhere where they have not painted themselves into the same corner. The States is another example where population overshoot has occurred from finding a continent full of oil and resources virtually untouched. 300 million people there are already finding out what overshoot means. Wow what a price! The Pink color....I could do without it, but it can always be repainted. And it would look so cool with an bunch of antennas up on top. Any power lines? That's my problem here. By the way, over here our problem is with the left who have no idea what they are doing and think nothing of taking money from Taxpayers, paying themselves and dividing the "races". There's even talk, the US will be the next Greece. With Obama, that's a good possibility. A true shame. Hi Norm, yes its the same in Europe, with left wing governments milking taxpayers to the hilt and beyond.I do so hope that the U.S. can survive the assault on those values that built the country. Perhaps after the "we can" (wiccan?) religion dies, the U.S. can get back to business. I sincerely hope so. Good luck. But all the governments here are "left wing" in that context. My wife Olga grew up in Russia and listening to the political debates here she said there is far more socialism here than there was in the Soviet Union. She never heard so many politicians talking about a "fair society." Here they have taken socialism to such an extreme that people who are prudent and try to save for the future are penalised while the spendthrift and irresponsible get handouts paid for by our taxes. At least there's an upside - I feel now that if I want a new radio then the hell with it, I'll have it. I'll get more value for the money than if I saved or invested it. Well said Julian, I totally agree. That Flex radio is getting closer for me as well. Cheers.